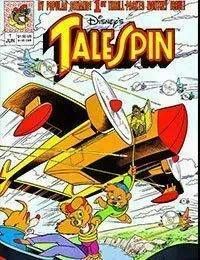 SKY-RAKER: Part 1 Following an Air Pirates, Baloo, Kit, and Wildcat set down on an uncharted desert island where they discover Lily Ravenwood, the daughter of the late Prof. Harrison Ravenwood. She has been here with a special experimental airplane, thought lost for the last two years. Shere Khan had once struggled to obtain the airplane from Ravenwood, and will stop at nothing to get it today.